Word in now from Sean Fenniman at Allied Marine of a $200,000 price reduction on the 26.21m motor yacht Gorgeous Gal. 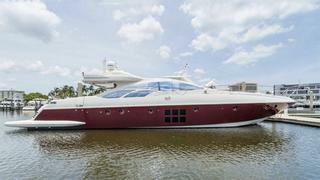 She was built by Azimut in 2007 for the current owner, and Gorgeous Gal is in turnkey condition. Accommodation is for eight guests in a master suite, VIP stateroom and two twin cabins and she’s powered by twin 2,000hp MTU engines driving Hamilton waterjets with joystick control. Notable features include a retractable saloon roof and a large teak aft deck with ample seating. A large saloon offers comfortable relaxation with three couches, two ottomans and an expandable dining table. She is fitted throughout with Crestron entertainment systems. Gorgeous Gal is located in Fort Lauderdale, Florida, and she is now asking $2,295,000.